The sun is casting an orange glow onto the pillars of Wat Chaiwatthanaram temple as it sets. Above me the sky is darkening but still has tones of blue, pink and purple and the moon has just started to show through. We climbed up some steps on the edge of the ancient ruins that make up this magnificent temple and watched as the darkness engulfed us and the ruins developed a romantic but macabre feel. A couple of hours train ride away from Bangkok, Unesco world heritage city, Ayutthaya is unmissable. It was once the capital of the kingdom of Siam before it was torn apart by the Burmese. Now it’s a city of overgrown temple ruins, steeped in history and culture; untouched but definitely not forgotten. I arrived in the city feeling a little groggy from jet lag and with no set plans but within an hour of checking into my hostel, adventure is calling and I’m on a sunset boat ride with some travellers from my hostel. 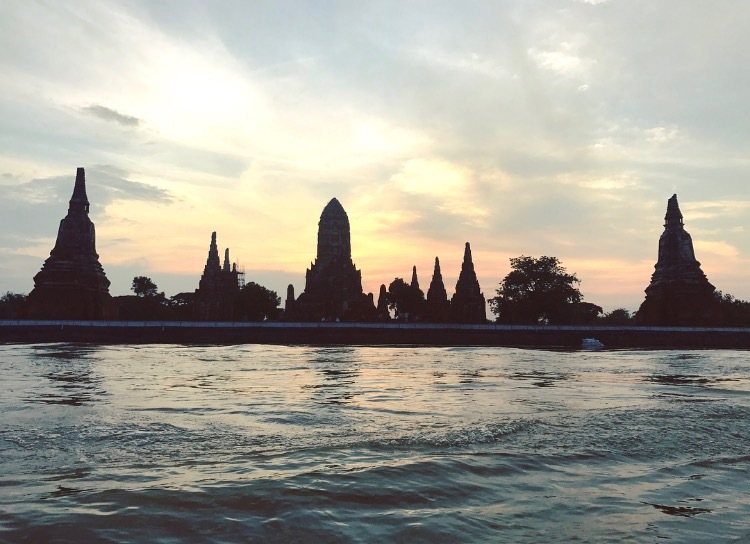 The main temples of Ayutthaya are on the main island, surrounded by water, so boat is the best way to get around. A short trip down the river on the long tail boat takes us past riverside houses, many flooded from the last of the October rains. Local children are still playing in the water regardless, some swimming in what would have been their front gardens. We sail next to greenery and more houses and then out of the trees, the pillars of the most magnificently intricate temple rise into sight. The ruins themselves are colourless and grey but the scene is adorned with colour. Small shrines decorated with flowers and gold and other offerings surround the temples. Monks in their bright orange dress are easy to spot. As our boat leaves the temple, what seems like a hundred fish start splashing about, completely drenching me. A local says that the water by the river is sacred and fishing is forbidden. Now this part of the river is full of life. Its nearly nightfall and we head to Wat Chaiwatthanaram to watch the sunset. Perhaps the most impressive of all the ruins, this temple is the perfect place to see the day out. The city is split into two halves by the river. Don’t fall into the trap of paying expensive tuk tuk fares to cross over. It’s 5 baht, (about 10p) to cross the river by boat and is the better option if you’re staying nearby the station. Ayutthaya is very bike friendly and there are plenty of places to rent them from. Most of the main temples are close together so a bike is a good way to get around. Temple entrance is between 50-100 baht per temple. Arriving and leaving: There are regular trains departing to and from Bangkok and cost just 15 baht. If heading to Chiang Mai then the best option is the overnight train, although book in advance as it fills up pretty quickly.